The numbers are staggering - 2,45,000 spectators at the circuit (5,000 more from 2012), 24,000 spectators on the first day of practice, 47,000 on the second day of practice, 23,000 spectators on test day. It sounds like, and quite evidently is, a lot of people. Let's move onto the circuit then - 13.629km long, with cars hitting speeds in the region of 320kmph at Mulsanne, before they slow down to around 60kmph at the end of the straight. But it's one thing to know the statistics, and entirely another to see them come alive. As we walked past the campsites, drove down the roads that would take us to the track, and saw the sheer number of people in the grandstands, we knew there were a lot of people. 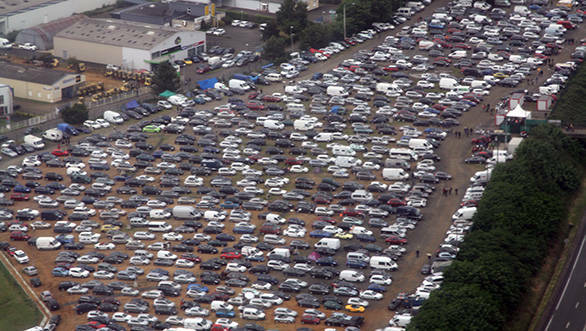 But only when we went up in a chopper did we realise the scale of it all - just look at the number of cars and motorhomes parked by the side of the track and it would give you a fair idea of just how packed the little town of Le Mans gets during the race week. It's unlike anything else we've ever seen. But none of that compares to sight of racecars at the main circuit. We were hovering over Mulsanne when I saw a Corvette driving down the straight. Of course, from that height it looked minuscule and disappeared in the blink of an eye. As the helicopter circumnavigated the track, the cars blast past us. We were unable to catch up. 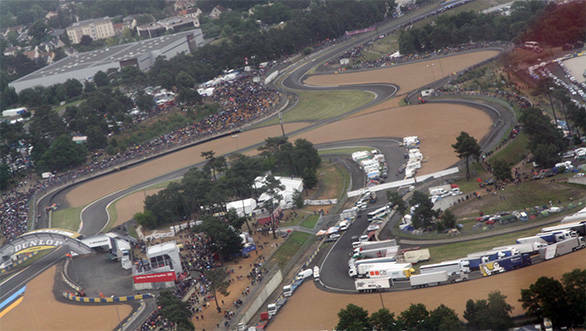 Even from up in the air, we couldn't view in the entire circuit in one glance - that's how big it is. Le Mans - there's nothing quite like it!